RITTAL says designers and technical buyers in mechanical engineering can now plan machinery and process cooling more easily than ever thanks to its new TopTherm Configurator. 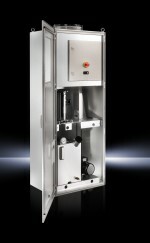 Rittal says the online tool will help users precisely determine the necessary cooling output, quickly select the appropriate solution, and automatically compile all the technical data – in just four steps.“We have had more than 8,000 requests about the configurator in just three months, which underlines just how interested customers are in the benefits it offers,” says Christian Westwood, Rittal’s product manager for climate. The tool, which is available in seven languages, can help designers and technical buyers in mechanical engineering to design chillers (recooling systems) quickly and easily. The Configurator offers an accurate and automated basis for calculating the cooling output required.